When I was growing up in Honduras, my father wanted me to be an mechanical engineer, but instead I felt the calling to become a priest. Papa’s probably looking down from heaven onto this uncertain world we live in today thinking, “Thank goodness he chose a profession with long-term job security”! Little did I or my father know 50 years ago when I was in the seminary, that not only would young people have no job security in the third millennium, but neither would their parents. In mid-September, I attended a conference organised by Caritas and the Pontifical Council for the Family to reflect on how the family can be an important resource in facing the financial crisis. September is traditionally a time when many young people around the world start back to school after the summer break or choose a career path following their college degrees. Yet for young people today not only are there few jobs for them, but the contracts offered to them rarely allow them to build a dignified life which allows them to buy a home and raise a family. For six years now, the economic crisis has cast a long shadow over people’s hopes and possibilities. In this time the free market has produced one sector which is booming: social exclusion. The 85 richest people in the world hold as much wealth as half the world’s population. In this world of extremes some young people are lucky to even get an education. In wealthy countries such as in Italy and in Spain, more and more families are turning to Caritas for help to buy school books for their children. Meanwhile, in the parts of the world brought to their knees by war, families and their young people are robbed of their homes, their country, their hope and their chance of an education. 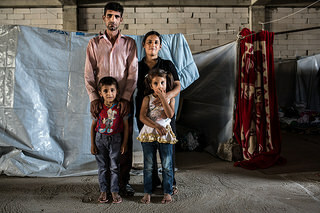 Eighty percent of Syrian refugees in Jordan are under 35. A great many of them have no chance of going to school either in Syria or as refugees in other countries. The inheritance that we are leaving our younger generations is an enormous and shocking contradiction: while an exclusive group is becoming wealthy beyond its wildest dreams, the queues at the doors of Caritas are getting longer and longer. We are leaving our young people a world with more instability, less employment, and fewer opportunities. A world where getting married, setting up a home and having a family becomes a distant dream. At a time when people need more than ever to have a family around them to help cushion the repeated blows dealt by this time of crisis, people are finding themselves increasingly alone and isolated. Even when they have a family, people often don’t feel valued as part of society. Secours Catholique (Caritas France) told us that vulnerable parents have no one to talk to but their children. The financial and social instability of the crisis leaves them feeling useless and without a place in the society of exclusion. Our greatest challenge at this time is to ensure that our energy as individuals, as families and as societies, is focused on the common good rather than on individual need. The Holy Family reminds us of the importance of staying together in times of difficulty. The figure of Christ our Lord inspires us to go out and take care of those who are fragile or who have lost their way. Today’s families may be reluctant to admit they’ve fallen on hard times and need financial or emotional help. As Christians, we need an “x-ray vision” which can penetrate people’s hearts and recognise when they need a hand. Within our own families we need to be vigilant and aware of the need for unity, support and understanding. Above all, we must value the families in our society and help them to realise that they’re an enormous resource of hope for us all and that they are the building blocks with which our societies are made. With this thought, we can build a future where we embrace our one human family and where the doors of society are open to everyone. In this future, capitalism would be made redundant and love and compassion would become the global currency. Cardinal Rodriguez’s full speech is available here. 23/09/2014 Africa, Asia, Development, Europe, Latin America, Meetings & Events, Messages from Rome, Middle East & North Africa, North America, Oceania, Poverty Elimination, SDG by Oscar Andrés Cardinal Rodríguez Maradiaga, s.d.b.